Call us to schedule a free first kitchen design session: 781-933-3339. How do I start the process of a kitchen remodel? How much will my project cost? It’s common for someone will drop into our showroom or call and tell us the dimensions of their room, and ask, “What is the general cost of new cabinetry?” The answer to this question depends not only on the size of your space, but also whether you plan to change the ‘footprint’ of your kitchen (meaning, will you change walls? impact the electrical and plumbing? etc. ), and the quality and features of the products you select (for instance, cherry cabinets typically cost more than maple, and there are many paints, glazes, and cabinet door styles you can choose in addition to the wood you select.). However, a typical 10 foot by 15 foot ‘L-shape’ kitchen ranges anywhere from $3,500 (using our basic, quality stock cabinet line) to over $40,000 (using a full-custom cabinet line, high-end appliances, and special features and accessories—lots of ‘bells and whistles’). What you invest depends on your goals for the room and your home. What’s nice is, because of the product range available, you can get great-looking, quality renovation results for a wide scope of budgets. What role does a Carole kitchen designer play in a remodel? As you can probably imagine, every inch matters when putting together the puzzle of cabinets, appliances, etc. You have literally thousands of options for cabinetry styles when you take into consideration paints, glazes, stains, and door style details. There are also many options with countertops, appliances, hardware, etc. Carole kitchen designers are professionally trained in products and layout/design strategy to help you maximize your space in terms of appearance and functionality. Your Carole kitchen designer collaborates with you to provide computer-aided design—a 3-dimensional layout created with software specialized for kitchen and bath design, which allows you to ‘see’ realistic-looking perspectives of your new room. He or she visits your home to do an on-site measure and view your space. Product selection within your budget is another huge piece. Carole designers offer education about the pros and cons of what’s out there and how to help you get the best quality for your investment, and also, suit your personal style. The demo of your original space and installation is handled by your contractor, who is in communication with your designer as needed to ensure accurate installation. If you need a good contractor, we are happy to refer you to one of the many people who we have extensive history working with. What is the difference between granite and engineered stone? Granite is a naturally occurring stone that is simply cut and polished, while engineered stone, also called quartz (sold under brand names Silestone, Cambria, Zodiaq, Caesarstone) is man-made (using 90-95% quartz, which is one of the hardest minerals on earth). Granite can look more natural and it is recommended that you seal it 1-2 times per year depending on the color. Engineered stone is typically more durable and more uniform in appearance and requires no maintenance. The cost for these products is quite comparable. Carole’s offers both quartz and granite. You can see many, many samples in our showroom. Are some cabinets more eco-friendly than others? Material that has no VOCs (volatile organic compounds). For example, the manufacturer should use non-toxic water-based glues, adhesives, and finishes. Executive Cabinetry is one of the most ‘green’ cabinet lines on the market today, and it’s available at Carole Kitchen & Bath Design. Executive uses water-based stains and coatings, formaldehyde-free adhesives, and the brand is certified by the FSC to ensure that raw materials come from forests that meet the social, economic, and ecological needs of present and future generations. What are the current trends in wood finishes? White-painted, transitional-style kitchens are still super-popular in Greater-Boston, and in recent years, we have seen an upswing in gray-painted kitchens. We also have had fun designing many unique kitchens, like a recent 2016 kitchen with teal-painted base cabinetry. Yet many clients opt for sleek, contemporary, darker-wood designs. Bottom-line, it’s up to you, and not what’s trending or what your designer may personally like. Someone who plans on renovating now, but selling the house in a few years may make a very different and more strategic real-estate choice than if he or she is planning on being in the house for the next 20 years. These days, choosing cabinetry is not as simple as choosing the brown or the black version of the shoes or a pump or the flat. But we will guide you through, and narrow the funnel. Just keep in mind that when you look at cabinetry options, you will quickly find that there are many, many versions of one ‘color’ (never mind door styles, which are also incredible in number). For instance, within KraftMaid Cabinetry’s offerings (KraftMaid—known as a ‘semi-custom’ line—is the largest cabinetry manufacturer in the world), ‘white’ appears in many variations, such as; Biscotti, Canvas, Dove White, Vanilla Bean, and Irish Cream. With full-custom lines/brands, such as Dura Supreme or Elmwood, there are even more options within the ‘white’ category and in some lines, you can even custom-match well-known paint brand colors. Deeper color values such as Peppercorn and Kaffe are prevalent within both modern design and key traditional looks. Finishes such as Praline and Butter Rum Glaze provide a mid-tone value that is growing strong. Honey Spice holds strong as the leading finish for KraftMaid. Glazed finishes continue to be very popular; they provide a furniture appearance to a design and coordinate well when paired with other finishes. It helps to see many displays in person to get a sense of which color appeals to you, and to talk with a designer about how color will impact your particular space, given important factors such as room size and available natural light, etc. So we hope you make a visit to our Showroom and get ideas! Ready to visit for a complimentary consultation? Click here. A friend told me you need to be extra-careful with water damage if you get painted cabinets. Is this true? It is true. As you know, wood is a product of nature. When you add water to wood, and that certainly includes painted wood, it takes a toll over time. Many of the calls we get about painted cabinets after they have been ‘in-use’ for a while, have to do with the cabinetry around the sink and the trash cabinet. It’s super-important to be aware of exposure to water and liquids of any type. Be sure to wipe and dry spills and moisture—pronto. Be sure your countertop seal is tight as well. Some people have a pull-out sponge drawer at the front of the sink. Don’t let a soggy sponge sit there or drip down the back of your cabinet panel. No matter how amazing, or high-tech, or careful the finishing process, if you let spills of any kind sit, well…it likely won’t be so good. If you are hard on your kitchen, you should consider this when choosing your style, finish, and color. That’s another way a designer can guide you through the options with a realistic voice of experience. No matter what finish you have, especially with painted wood, the better you take care of your cabinets, the better they hold up over time. Will my wood cabinets’ color change over time? As wood ages, the appearance of the finish may change or darken over time due to factors such as interior lighting, sunlight, and humidity. Of the most commonly selected wood species, cherry is the one most apt to have noticeable changes within the first year or two. Finishes react to prolonged exposure to tobacco smoke, resulting in discoloration, which is especially noticeable on white and lighter finishes. Showroom cabinetry samples, depending on age, room lighting and environmental factors, may look different from the new cabinetry installed in your home. To ensure satisfaction with a finish color, ask your Carole’s designer to borrow a door sample and take it home to look at in your space. Ask your professional Carole’s designer to describe the intricate differences between their products and how to care for them long-term. Does Carole’s charge a separate fee for design? No. We always create a first design based on your rough measurements of your space at no charge. This helps you get a sense of our professional design capability and the potential for your project. It also helps you get comfortable with Carole’s, your designer, and what we offer. If you decide to proceed with us, we charge a retainer fee, which goes toward your cabinetry purchase. We continue refining your design from there. (Your designer has the benefit of our entire team as a sounding board and for critique, with more than 100 years’ worth of kitchen design expertise, as you perfect your customized design together.) Before we finalize a design, we come to your home to do a professional measure. Is your Showroom open to the public? YES! It’s the largest in the area with more than 50 kitchen displays and a separate In-Stock Vanity Center. We believe that offering you a great showroom helps you determine your likes and dislikes and gets you comfortable with the many, many product options. Come visit us! We are open Monday & Friday from 9-5 p.m., Tuesday, Wednesday, and Thursday from 9-8 p.m., and Saturday from 9-4 p.m. Drop in or request an appointment. (Note: Appointments are always key if you want one-on-one designer time, and a great idea on Saturdays, when the showroom tends to be quite busy). No. Carole Kitchen and Bath Design does not install. We collaborate with your builder/remodeling contractor, and we pride ourselves on providing contractors with thorough and professionally-designed plans. Don’t have a builder or contractor yet? No worries. We have extensive knowledge of contractors/builders to whom we can refer you. They do not work for Carole’s, and this hiring choice is always yours. Why would I choose Carole’s versus a big box store? Great prices, and many more options. People are often surprised that we are very competitive with box stores price-wise. Our product range allows us to hit a huge range of target budgets. Additionally, because we have solid relationships with our vendors, we get great prices and can pass along value and savings to you. For instance, we are the largest KraftMaid cabinetry dealer and Dura Supreme cabinetry dealer in the region. And since we’re one of the region’s largest kitchen and bath cabinetry dealers, you choose from hundreds of door styles and finishes among all the cabinetry lines we offer. We have many styles that aren’t available elsewhere. Plus, we carry, Executive brand cabinetry–one of the ‘greenest’ lines available. based on years of expertise and design creativity. Home centers typically train people from the paint and wallpaper departments who often have no formal design training/education—resulting in much higher design error rates. Personalized service. Work with one designer from start to finish. Don’t worry about a crowded “big box” atmosphere where you’ll be interrupted by phone calls and pages and have to compete with other customers for your designer’s attention. Customer service doesn’t stop once your order is placed. Need more parts or have a concern? We can help with replacement parts or any other issue in a more timely manner so that your job gets completed on schedule. Flexible, convenient shipping. We can hold your order in our on-site warehouse until you’re ready for it. Did you know that most other dealers and home centers do not have a warehouse? They direct ship or use a separate shipping company. As a result, you are required to schedule your delivery immediately after ordering—without being sure when your project site will be ready to receive your merchandise. We’re an owner-operated firm, where we stand behind quality products and personal service. Read our reviews! Let our past clients convince you why Carole is the best! Do you design entertainment and desk areas? What about laundry rooms? Sure! Our cabinetry design expertise and products offer solutions for multiple areas in your home—not only kitchens and bathrooms. 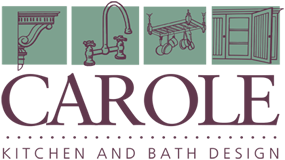 The products you will find at Carole’s allow you to create beautiful, functional spaces—whether you want to update your kitchen or bathroom, or build an entertainment center, closet, bar, desk, study or home office, laundry room, or pantry. 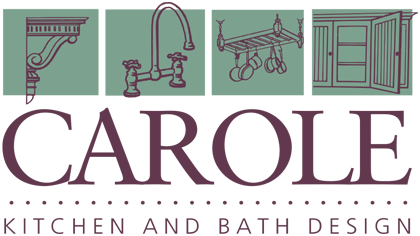 Carole’s has been in business since the early ‘90s and is built on trusting relationships with our clients, team, manufacturers, and our community. We specialize in expert cabinetry design and deliver hundreds of residential custom-designed kitchens annually in Eastern, MA.